Combining a high-level conference with a leading edge exhibition and unparalleled networking opportunities, the FTTH Conference is the largest FTTH-focused event in the world, gathering over 3,000 participants during its last three editions including Stockholm in 2014. Registration for the Warsaw event will open in September 2014. Fibre installation is faster and more cost effective with the new 3M (Booth G02) Easy Cleaver, which complements 3M’s existing fibre connectivity portfolio of simple-to-install field-mounted connectors and mechanical splices. With significantly less upfront capital expense and no specialised training required, the new tool helps enable service providers and contractors to meet the increasing subscriber demand for fibre even faster. Each Easy Cleaver provides approximately 120 precise flat cleaves with an innovative fibre clamping design and a diamond wire cleaving mechanism instead of a blade. Therefore, the Easy Cleaver requires no maintenance or blade rotation. The tool is included with selective packages of 3M No Polish Connectors, 3M Crimplok + Connectors and 3M Fibrlok II Splices. ‘Go GIG or go home’ is the eye-catching theme of the Calix (Booth G13) presence at FTTH Council Europe in Warsaw this year. For Calix, 2015 will undoubtedly be the year of Gigabit, as the company presents real-world case studies throughout Europe, from Ireland to Armenia. Calix will demonstrate how its Gigabit-ready business and residential deployments are ensuring the Gigabit experience all the way to the device. The Calix booth features the company’s new 844G and 854G GigaCenters, technologies that allow service providers to become part of the home and to leverage this strategic location for end-to-end visibility, management, and delivery of advanced broadband services. GigaCenters are the first fiber products in the world to unleash the power of carrier class Wi-Fi in the home, ensuring you deliver all the potential services and speeds of FTTH all the way to each device with service visibility and manageability. DIAMOND (Booth S11) has been successfully serving several markets for over 30 years as a worldwide leading supplier of high precision fibre optic solutions. Known to be dynamic and innovative, they carry out reliable, customised solutions, responding to increasingly demanding customer requirements. Further to headquarters, established in Switzerland in 1958, DIAMOND can count on an extensive international distribution network. - The innovative and unique OLiD (Optical Line Identification) system, which is based on Fiber Bragg Grating (FBG) technology, and offers a fast search and identification process for installation errors and outages. - The versatile and small DiaLink connector system, that thanks to its user-friendly and push-pull design can be used in a wide range of applications. - The DiaFlex fan-out that provides increased flexibility when installing and linking fibre-optic networks. Emtelle (booth Booth B01) is a provider of end-to-end passive network and ducted network solutions, which offer flexibility and scalability throughout the lifetime of the network. The company is directly or indirectly present in all FTTX markets worldwide. Emtelle has many years’ experience in its two core business sectors: FttX (Fibre-to-the-X), where our technology is used in numerous high-bandwidth applications such as FTTH, deployment in MDU (Multiple Dwelling Units), Telemetry, and Intelligent Transport Systems under the fibreflow brand name. Secondly Infrastructure, where we deploy our ducted network solutions in, for example, Telecom, Power and Geothermal applications. In all these fields, we have completed numerous projects. The company will continue to provide its customers with SMART end-to-end passive network solutions delivered seamlessly from network design to completion by a single, dedicated company. Its headquarters are in the United Kingdom, and it has offices around the world, including the Netherlands, the Nordics, Australia and Malaysia. Planning FTTx networks used to be challenging. Both in the strategic phase – when estimating costs, comparing technologies and maximizing the Return on Investment – as during detailed planning – creating optimal to-build plans while integrating field survey data. FiberPlanIT (booth B01) answers these challenges, making planning FTTx networks smart, fast and easy. Smart FiberPlanIT’s unique optimisation algorithms calculate the most cost efficient network - enabling savings in Outside Plant (OSP) design of 7 per cent on average. Fast FiberPlanIT allows you to design the OSP for 7000 connections in less than three days. Easy FiberPlanIT users are assisted throughout the whole planning process, from strategic planning down to detailed design, interfacing with the best GIS Management tools on the market. Fujikura to present complete 360o offering of fibre solutions at FTTH Conference 2015. From fibres and cables to fusion splicers, Fujikura’s new products include Low Friction Cable for easier installations and Spider Web Ribbon (SWR) which is a space saving and mass fusion ribbon splicing solution. For smaller cable designs, 200 micron diameter fibres are presented, plus a Reduced Attenuation fibre with Bend-Insensitive characteristics (RABI). Fujkura’s FuseConnect ‘QA’ type connectors are a new addition to the FuseConnect range with its simplified termination process. Fujikura’s splicer line-up will feature 12S - the world’s smallest and lightest splicer, and 21S – the new, advanced FTTH splicer. 21S features include new Active V-groove Alignment technology, universal sheath clamps, long battery life and fast splice time, in the world’s smallest, and lightest in class package. Both models are compatible with splice-on connectors, making them invaluable tools for FTTH deployments. Fujikura will also take part in the CTTS conference workshops, delivering a session on fusion splicing, mechanical splicing techniques and field connectivity solutions. HellermannTyton (Booth B16) is an established provider of network infrastructure cabling solutions, offering a broad range of quality, high performance connectivity for both residential and commercial use. HellermannTyton‘s Broadband Systems comprise a unique range of fibre splicing closures for the external and internal plant that you would find in any typical FTTX application. The sealed closures from HellermannTyton protect the fibre management systems from adverse environmental conditions whilst maintaining ready access for effective cable installation. The fibres are housed in space saving modular units that minimise network disruption and have been designed to allow further modules to be added at a later date for increased capacity, ensuring a future proof design. All of the closures from HellermannTyton offer flexibility and access so that more fibre can be added in the future (up to their maximum capacity). All of the closures are compatible with Cablelok, HellermannTyton‘s 100% per cent mechanical seal. HUBER+SUHNER (Booth G16) develop and manufacture fiber optic products for challenging applications requiring the highest of data rates. Their comprehensive portfolio includes cables, connectors, cable assemblies, cable and distribution systems, along with fiber management systems. Video conferencing, high-definition television, video-on-demand and telemedicine are increasing the need for broadband access. To satisfy such demand, critical infrastructure is required, deploying optical fibre from distribution centers into customer premises (Fibre to the Home or FTTH) and the appropriate cabling within the building itself (Fibre in the Home or FITH) for which HUBER+SUHNER offers complete system solutions. After all, network operators require a clear focus and strategy to meet this demand in the future throughout the whole network from the Central Office to the Outside Plant and right down to Fibre in the Home. HUBER+SUHNER, as an innovator for FITH connectivity, accepts the challenge and is ready to connect the next generations. Icotera is a leading European developer and manufacturer of standard-setting Fibre-to-the-Home (FTTH) gateway solutions. Icotera develops vendor-independent Residential Gateways with best-in-class Wi-Fi, superior design, quality and performance, and provide FTTH network operators and service providers (ISPs) with tailor-made, flexible and cost-effective solutions that fit their individual needs. During the 2015 FTTH Council Conference Icotera will launch new innovative CPE and ONT products and demonstrate a unique Smart Home platform integrated in their gateways. On the 11th of February at 12.50-13.10 Icotera is hosting a presentation in the Exhibitors Presentation Room, where CTO, Kim Esben Jørgensen, will talk about the vast opportunities in QoE and Big Data steaming from Residential Gateways. The presentation will highlight how these areas offer new exciting opportunities for improved customer service & satisfaction together with additional revenue streams for network operators and ISPs – Icotera looks forward to welcoming you at this presentation. The John Guest group (Booth B5) has a long established reputation as a leading manufacturer of push-fit fittings, tube and other fluid control products. This reputation is built on producing consistently high quality products with an ongoing commitment to value engineering and product development. John Guest’s blown fibre fittings have been specially designed for the telecommunications market, for use in local loop, network and customer box applications. The extensive range of push-fit connectors cover both blown fibre and cable pressurisation systems and includes gas and water block fittings. The simple to use connectors help ensure that installations can be completed quickly and reliably. Keymile ( Booth G06) will be showing its new MileGate Fibre Series – developed for tomorrow’s market requirements for optical fibre networks. This product is the latest addition to the MileGate family and will be launched at the FTTH Conference. Its goal is for you to harness German-made Keymile technology to offer your customers the best telecommunications services. Keymile can support you in selecting the right broadband technology for the future of your network. Its multi-service platform MileGate delivers a variety of ultra-high speed services. This enables network operators to realise all FTTx architectures with highest port-density and minimum life-cycle costs. Keymile solutions combine performance, quality, design and innovation from our own research and development team. As specialist for technical system solutions in the energy technology, telecommunications and traffic technology market sectors, Langmatz (Booth S33) develops and produces infrastructure products for utility companies, public transport, industrial and telecommunications companies as well as cities and municipalities all over Europe and worldwide. Langmatz is also known for innovation and quality in the FTTx sector. With the market launch of the Langmatz optical fibre termination point in 2014, Langmatz can now cover all components in the FTTx sector with in-house products. Among others, Langmatz will present thier proven QualityBox, underground distribution systems and an optical fibre network distributor at our booth at the FTTH Council Europe Conference 2015. R&Mfoxs, the Fibre Optic Cross Connections system from Reichle & De-Massari AG, offers tailor-made, modular products for FTTx projects. Established Single Circuit Management provides the basis for smooth, high-density fiber and subscriber management on all platforms. Covering individual needs is essential for R&M. Competitive situations of network operators, legal regulations and environmental conditions vary from site to site. Our strength lies in flexibly and individually combining existing platforms. R&M has developed its R&Mfoxs fibre system into a full range, enabling network operators to flexibly plan the extension of FO infrastructures to suit their particular requirements. FTTH 2015 will see Senko Advanced Components (Booth S09)exhibit its Wi-Fi Smart Probe. Responding to an industry demand for a cordless device with ease-of-use features that are practical in the field, the Senko Wi-Fi Smart Probe also provides image capture; build quality & user friendly interface software. A Lightwave innovation award winner with 960 x 554 image resolution, still capture & zoom capabilities, it is sold with two rechargeable batteries and a free Android App that is available to download on Google play or Senko online. Images are captured digitally and streamed on the monitor of any Android Tablet or Smartphone. Featuring integrated Wi-Fi module and left/right handed thumb or finger operation for greater ease of use and convenience & sold with tips fitting 1.25mm & 2.50mm ferrule sizes. TE Connectivity (booth G18) is a leader in the design and deployment of next generation broadband network infrastructures from the central office through the outside plant to the customer premises and from the data center to in-building networks. At this Conference, TE presents its cutting-edge FACT Optical Distribution Frame system enabling faster and easier installation in a high density environment. 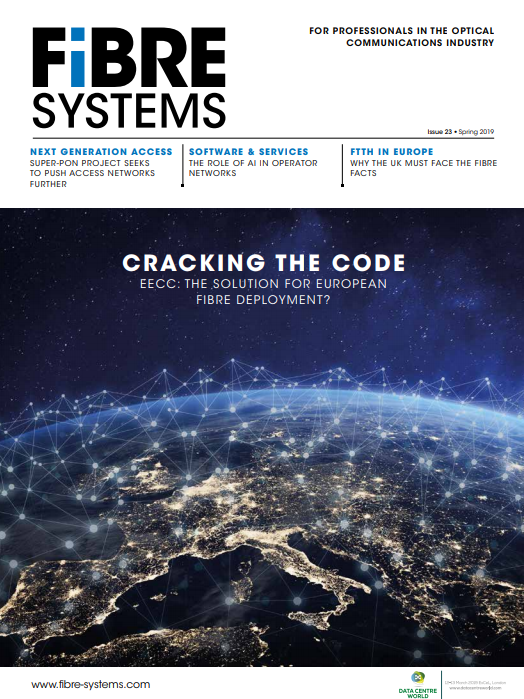 The tool-less system with high-level modularity guarantees easy migration to new connectivity platforms and supports the growing number of fibre cables in central offices. For the outside plant, TE will display its latest developments in fibre enclosures. For customer premises, a new family of floor boxes has been developed to speed up FTTH rollouts into the wide range of customer premises that are found across Europe. TE builds the critical connections that make fibre deployment faster, capacity greater, installation simpler and network reliability better. From design to delivery to what comes next, we make sure every connection counts. Delegates stopping by the UTEL booth (B38) at this year’s FTTH Conference will hear about the latest developments in the company’s revolutionary Fast Light technology. UTEL uses Fast Light as the basis for a centralised G-PON fibre management system, which is the only existing technology in the world able to reliably detect ONT reflections through 128 split PONs without expensive wavelength dependent reflectors. This measurement is enabled by UTEL’s Advanced Reflection Detection (ARD) technology which sets a new global benchmark for OTDR performance and has the potential to greatly reduce the cost of building and operating fibre networks. A range of other products for FTTH deployment, including UTEL’s PTO 4 customer termination unit will also be available. The innovative PTO 4, launched last year, can serve between one and four outlets and is factory terminated with cables up to the length of 60 metres, simplifying the FTTH installation process.